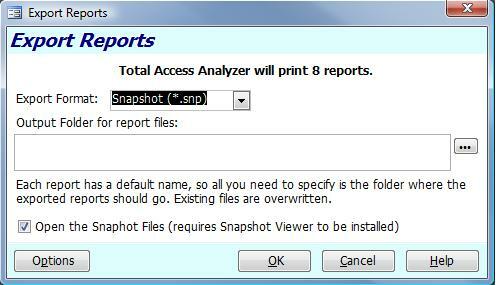 Total Access Analyzer 2003, Version 11.8 is not the latest version. Version 11.95 was released in 2015 with many new features. Existing 11.8 customers can upgrade for a nominal fee. Visit Version 11.95 for details. 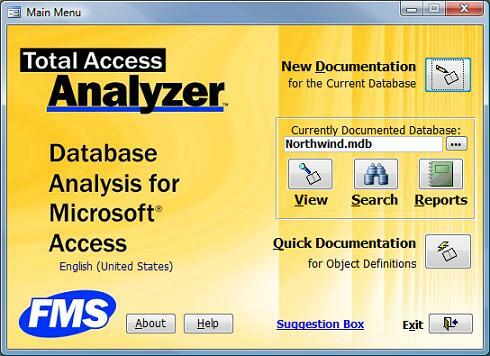 FMS is pleased to provide a major update to Total Access Analyzer for Microsoft Access 2003, 2002, and 2000. Total Access Analyzer is the world's most popular Access product. If you have a version prior to the X.7 version, click here to see the features that were added in X.7, which are also part of the X.8 version. Microsoft Access 2010 users should upgrade to the Access 2010 version. Microsoft Access 2007 users should upgrade to the Access 2007 version. Total Access Analyzer X.8 builds on its heritage of helping Access enthusiasts create better Access solutions with a wide range of new features. We've added many enhancements based on our experiences and the recommendations of our customers. Thank you very much! We hope you like the results! 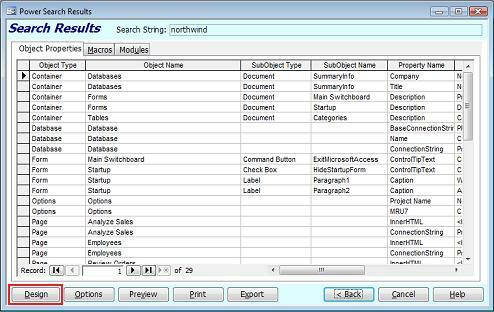 Main screen shows the context of the currently documented database and your ability to view, search, and print reports for it. You can also open it without closing your current objects. After documentation, reports without data are not listed to make it easy to see what's available. One click loading of the current object in design view. Whether it's from the Diagrams, XREF, Errors, Suggestions, or Performance Tips tabs, you can press Alt+D and put it in design mode to immediately review the object or module for the changes to make. 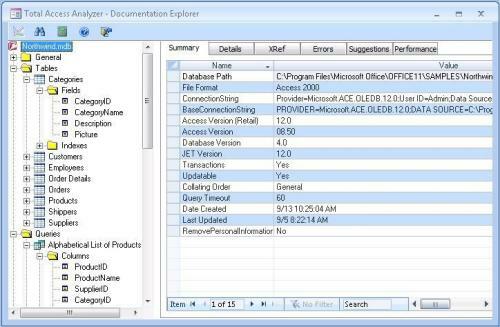 Here's a complete list of Best Practices detected by Total Access Analyzer. Total Access Analyzer addresses the limitations imposed by Vista and User Access Control. Rather than storing output databases for your documentation in the Total Access Analyzer folder by default, it now stores it in your Application Data folder. For a quick overview of Total Access Analyzer, Take the Tour.